My girls have been fans of the Olivia for some time now and I’m happy to announce that the hit television show that inspireds kids everywhere to think boldly and follow their dreams, has teamed up with Spin Master and introduced a new collection of fun toys for children 4 and up! We had a chance to check out a few items from the new collection including an Olivia 8″ plush and the Olivia 2-in-1 Transforming Playset! Read on to hear about our experience…. Lil’ loves her plush friends so I knew she would be thrilled with Olivia. 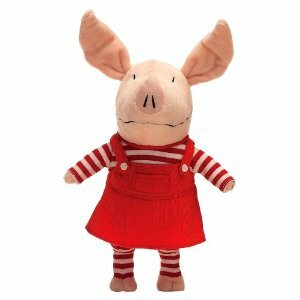 The Olivia 8″ plush is soft and small enough that children can carry her around anywhere they go and perfect for travel. The Olvia 8″ plush comes dressed in all of her favorite outfits and you can collect all four including artist, opera singer, cow and outfits. With this set children can use their imagination to go on real adventures with Olivia. The playset allows two different environments in one toy including Olivia’s house and pirate ship. 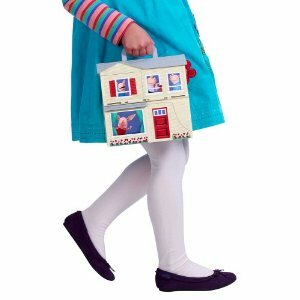 It magically transforms from one to the other in a flash and includes 23 accessories for both worlds including multiple pieces of furniture, an Olivia figure and even a sticker sheet. Our girls enjoyed switching back and forth from the house to the pirate ship and they were having a hard time agreeing on which world to play in. Go figure! The Olivia Plush and the 2-in-1 Transforming Playset are available at ToysRus, Target and Kmart! For more information on the new product line visit www.spinmaster.com. Disclaimer: I was provided with the above mentioned products for my review through Team Mom. My thoughts and opinions remain my own! I have to admit than I probably like Olivia as much as my toddler. The theme song is so catchy! Both items are cute & WOW at all the accessories that come with the play set. The toys look very cute. Looks like something that would make a great gift for my daughter Hannah. I am not sure if I have seen the show. The Olivia plush is super cute but I think my daughter would love the Olivia 2-in-1 Transforming Playset. The playset looks like it stores easily which is a necessity in our small living space. What fun toys and Olivia is such a cute book series. I love how they bring her to life with these toys.